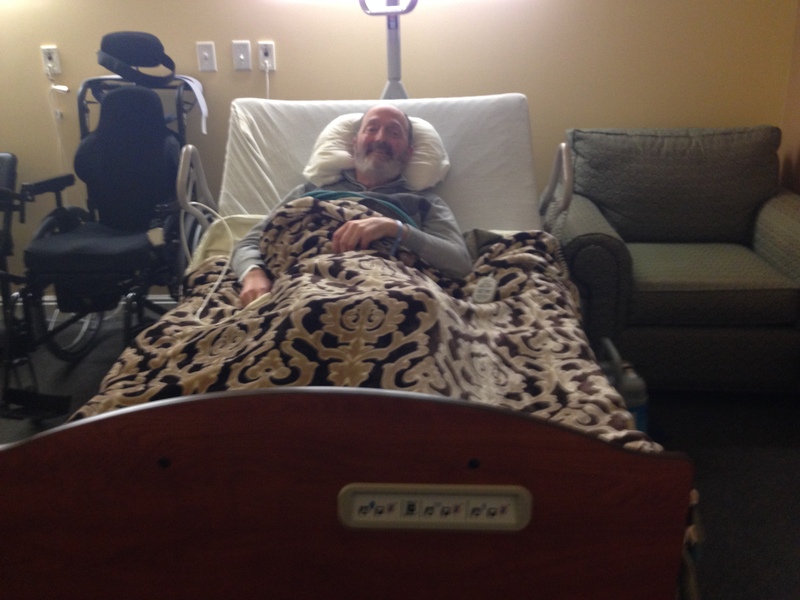 Mark’s left hip replacement went well last Tuesday, January 26th, despite the delay. It didn’t even get started until 5:30 PM due to difficulties with a prior surgery. Around 9:30 PM he was moved into a hospital room groggy, but awake. It made for a very long day and night. His appetite and strength have been very good. The main concern has been the dark, huge bruise from under his armpit to his waistline, not where we expected to see bruising after hip surgery, which makes me wonder what went on in that surgical room. Wednesday, Mark had a radiation treatment to slow the bone growth in his hips, which is the cause of his joint problems. Thursday, he was released from the hospital to Rocky Mountain Care. If you’ve experienced rehabilitation, you’re probably familiar with uncertainties like: How long will it take to recover? When will we realize the advantage of surgery? How much pain will have to be endured? These and possibly many more questions, along with the enormous desire to feel better right now are part of the recovering process. Before Mark was discharged from the hospital with the right hip surgery last July, I visited six rehab centers in our area which were listed with the insurance company. I can’t imagine spending such an important and limited time in a facility without doing research first. With the doctors recommendation, we’d wanted Mark could go to HealthSouth for rehabilitation. They specialize in neurological problems and since Mark has a traumatic brain injury (TBI), I knew they had equipment which Mark would need for rehab. However, the insurance wouldn’t allow it because this rehab was based on a hip surgery and not TBI. Disappointed, yet determined to get Mark the best possible help with therapy, our second choice was Rocky Mountain Care. I was impressed with their homelike atmosphere, clean smell and they had more equipment than the other gyms I visited on the insurance approved list. 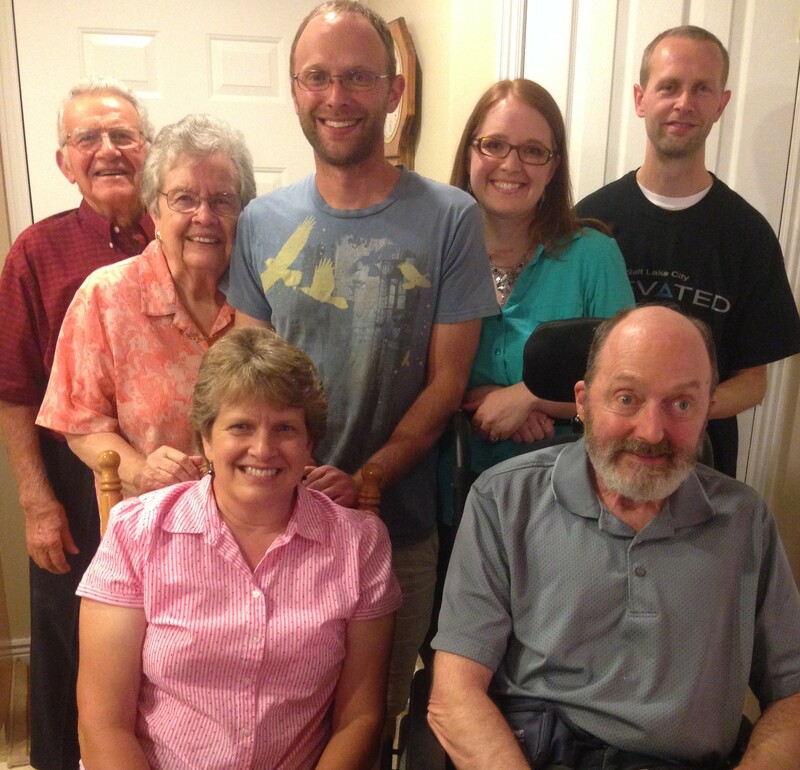 Mark’s TBI and physical limitations give him special needs. At home we have a standing frame and a roll-in shower along with a shower/commode chair which he uses daily. The rehab centers on our insurance list didn’t have either and since they’re important for his recovery, therapy plan and general health, I’m willing to bring them from home along with his custom walker. The challenge is finding a room which has space for it all, plus an extended bed for his height and a trapeze, which helps him change position while he’s in bed. Along with these essentials he needs the capability to maneuver his wheelchair in and out of the room. Wow, this list sounds pretty lengthy and must be why we don’t travel anymore. Suite kitchen and my office area. Door in between goes to bedroom. Fortunately, Rocky Mountain Care has a couple of rooms which can accommodate Mark’s needs and they’re willing to let us arrange the room to do so. In August and September of 2015, we were lucky enough to get a suite. It was beautifully furnished and definitely the nicest room in the building. The kitchen had a full-size fridge , small microwave and a solid wood dining table with six cushion chairs. Suite living room with therapy balloons and balls. The living room was furnished with a couch, two comfortable stuffed chairs separated by a table and lamp and a television on top of a beautiful wood stand. A large wood desk was in the back of this room by a glass sliding door which led out to a small patio. The view of the mountains from the living room and patio was spectacular. The separate bedroom had two twin sized beds, a large dresser, a chest of drawers and a roomy closet. The bathroom had ceramic tiles with a roll-in shower and was perfect for the shower/commode chair or wheelchair. This is unlike any other room Mark’s ever had in a rehab center. We felt spoiled and a little guilty for having it. The room was wonderful, but the biggest advantage to Rocky Mountain was the therapists. They were knowledgeable, caring and worked hard to improved Mark’s abilities. For this reason, they were our first choice this time around. It was nice to have the decision made before surgery and it actually decreased a day in the hospital because we made the arrangements beforehand. Since Mark has a severe short-term memory problem, he is dependent on me to keep him oriented. Unfamiliar surroundings and routine make him feel unsettled and his memory is worse. He forgets what he’s supposed to be doing and where he is, which can make him agitated or anxious. Since I want him to get the full advantage and have the best experience with rehab, I prefer to stay with him. The suite made it easier, but because it’s a lot more costly than a regular room, we are not in the suite for this round of rehab. It’s been an adjustment and the difference is like being on a cruise verses camping complete with an air-mattress for me. It’s hard for me to go home because I worry he might have a seizure and the nursing or aide staff will not know. I wonder if he’ll be able to find or remember how to use the call button when he needs help and the waiting time for that help also concerns me. Mark’s bed on the west wall. I like to be involved in Mark’s care—not to interfere, but rather assist while he is here. However, it’s awkward to step back since I’ve been taking care of him for so many years. I have to continually remind myself that what seems so obvious or natural to me isn’t for the professional caregiver who has several patients at one time with all different levels of abilities. I’m realizing every rehab experience is different even with the same patient, therapists and caregiver staff. But the goal is always the same—to get home stronger and better. We’re confident it will happen with the therapy and supported care we have here. 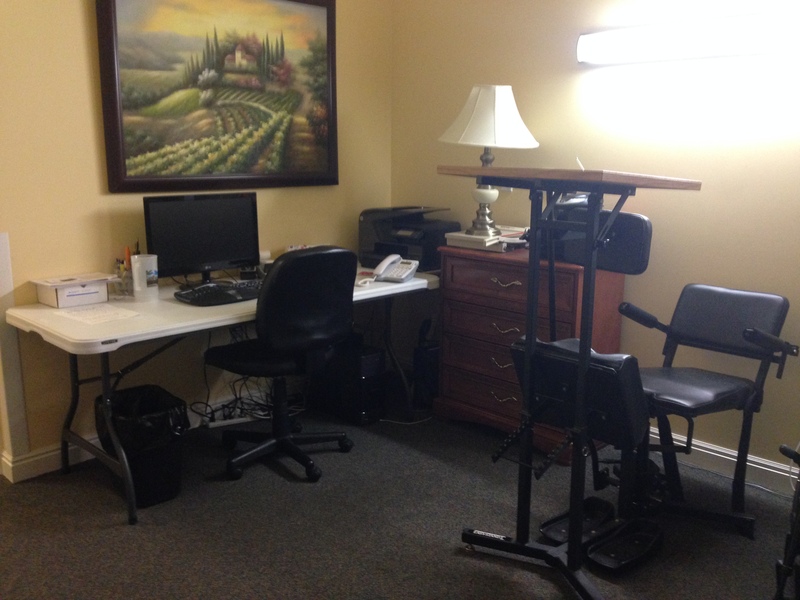 Mark’s standing frame and my work station. West and south wall. East wall with my air-mattress standing up, which I lay down for sleeping. We are grateful for all the well wishes and prayers. We feel blessed and amazed at Mark’s ability to heal and adapt to foreign implant objects. This along with all the love and care of others is the most wonderful part of recovery. “I’m not sure who the caregiver is in this marriage,” Neils said in part 1 of his story, Dancing with Class. I wholeheartly relate and have written about it myself in three other articles. Mark is my caregiver. He may not be able to make a meal or do the physical chores of housekeeping or yard work, but he does care about me and gives me support by waiting patiently for me to complete a task before taking care of his needs. He also lifts my spirits with humor, companionship and good times. Being with him is a pleasure. I love his wit and sense of humor. He also gives care through letters, expressing love and appreciation. These letters mean more to me than if he were able to give me flowers. My parents are my caregivers and have been my whole life. Even though they are well into their eighties, they give me and many others lots of care through meals, visits and sincere interest in what is going on in my life, along with any help or assistance I may need. My siblings are my caregivers and they too have been my whole life. They are all busy with their own lives and children, but they make time to check up on us. If I ever need anything I always know I can call on any one of them. It’s wonderful to feel the love and support of family! My children are my caregivers. When they were small it was wonderful to feel their love and admiration. They were sure I could fix anything and no one was stronger. As they grew, experience taught them differently, but their love kept me going. They are my strength and what motivates me to do and be better. Their care is different now they are busy adults and no longer dependent on me, but I still feel their care and love and it means a whole lot to me. My neighbors and friends are my caregivers. They give with listening ears and a caring heart. They give understanding, support and friendship. They are observant for what they can do to help without me asking for it. I’ve been fortunate to be surrounded by people who are anxious to help. Many times in the winter my snow is shoveled off my walks and I have no idea who did it. My church provides caregiving. Not only do I find comfort and solace in my church activities, but my association with people there has led to friendships and an organized volunteer program where two people come twice a week to help Mark with his exercises. So I just have to say, I’m one lucky caregiver. I’m supported by a lot of other caregivers who probably don’t think of themselves as caregivers. But I know they are and I know I couldn’t do my caregiving without them. If you care and you give, you are a caregiver. If you drive someone to an appointment, prepare a meal, watch children, or go shopping for someone else, you are a caregiver. You may think you’re just doing what anyone else would do—but anyone who helps is a caregiver. Thank you, Neils, for reminding us of the many acts of service which are considered caregiving. Who’s your caregiver? Feel free to leave your recognition in the comment square. Neils’ story, Dancing with Class reminded me of the benefits in looking back and remembering how smitten we were with our loved ones from the start. Beneath the surface of the caregiving responsibilities, it’s the beacon of love that motivates us in our journey. Taking a step back can rejuvenate our efforts. This expresses perfectly how I hope to make Mark feel—together, united and safe. I imagine that’s the goal of most caregivers. If your loved one isn’t able to communicate their love and appreciation for you, imagine Judith’s wonderfully expressed words. Caregiving is a physical manifestation of our love and hopefully our loved ones see it and feel it too. I love the month of November and the Thanksgiving celebration, which reminds us to be grateful for what we have and the people in our lives. 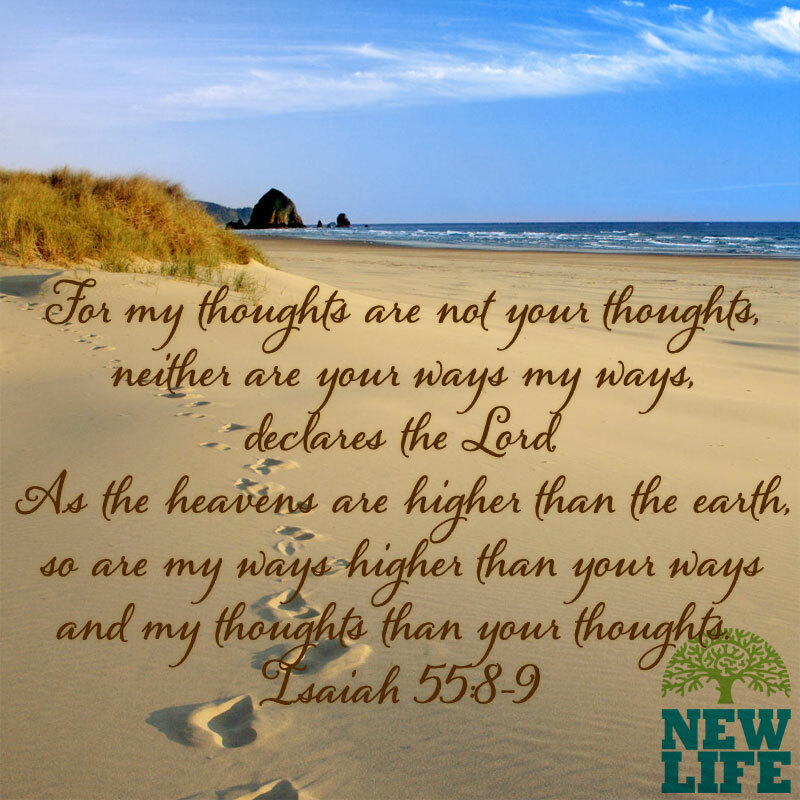 Taking time to reflect on our blessings and the positive traits of our loved ones brings joy and contentment in an otherwise noisy and hectic life. Our individual lives are chaotic enough, but when another person is relying on us for the most basic needs of daily living, responsibility and pressure are added from sun up to sun down. It’s no wonder exhaustion and doubts creep in concerning our ability to be a good caregiver. It’s been a tiring year for Mark and I. Tests, surgeries, therapy and too many needed doctor visits, which have nearly depleted all my energy. 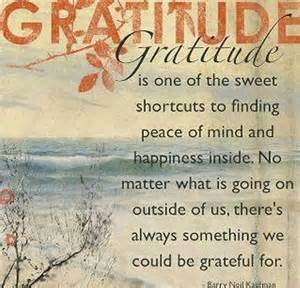 However, “no matter what’s going on outside of us, there is always something we could be grateful for.” I appreciate the connection and inspiration I get from other caregivers, which fill me up. I’m looking forward to the rest of Neils’ story and a Thanksgiving month, which continually reminds me to take time to count my many blessings. It has been too many years since I’d sat at a desk in a classroom, I thought while looking through the Adult Community Class Winter Schedule. My 2013 goal was to write a memoir about our experience surviving traumatic brain injury (TBI). It had been a story I wanted to write for twenty-two years, but didn’t know how to go about it. I knew I needed knowledge and help with this goal, so I was especially interested by the “Writing Class” listed on the schedule. I didn’t know how I’d make time for this class between my work and caregiving demands, but I signed up for it anyway. I recognized the familiar echoing taps of my shoes as I rushed down the large empty hallway of Indian Hills Middle School looking for the classroom. It should have only been a ten minute drive, but it took me longer because I’d never been there before and it was hidden in a subdivision unknown to me. I opened the closed door, late as usual and unsure of what I’d gotten myself into. As I hurried to find the closest chair, the teacher, Brenda Bensch, smiled and welcomed me to the class. Embarrassed by my tardiness, I apologized as she handed me the outline for the next several weeks. Although I wasn’t getting a grade or any kind of credit for the class, I wanted to do my best. I felt overwhelmed by the schedule. How would I fit writing on top of all my other responsibilities? I stayed focused on my goal and stuck with it. 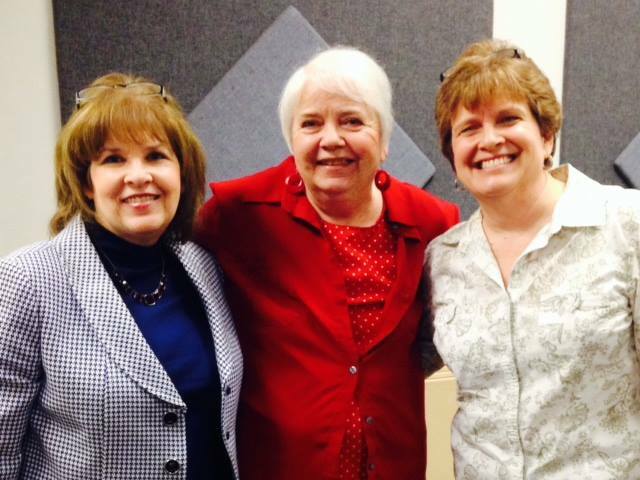 Not the most flattering picture of me, but the only one I have with my writing teacher, Brenda Bensch (in the red) and my favorite classmate, Susan Knight. That class and the next one in the spring influenced my life for the better and I have Brenda Bensch to thank for it. Some of her words of encouragement ring in my ears to this day. She taught if you want to be better at writing, you have to practice, just like anything else you do. “Start a blog; write every day or at least three times a week.” In my mind, I scoffed at the suggestion. There is no way I could make time to do that. I just want to focus on my book. The more I wrote and had my chapters critiqued, the more I realized the importance of practice. “Maybe I could start an online support group which could encourage and help other caregivers in the comfort of their own home and whenever it’s convenient for them.” Jessica loved the idea and just about every day for the duration of our stay she encouraged me to do it. I work on a computer daily, but had no experience online. How do I create a website which could encourage caregivers? My talented daughter, Katie, designed Uniting Caregivers and taught me how to use it. I’m so grateful for her skills and patience with me in this endeavor. My past writing experience has mostly been on a business level of composing demand letters for payments on delinquent accounts. Writing a book or an article is a very different style of writing and much more enjoyable I might add. I appreciate and I’m so grateful for my sister-in-law, Dianne, who proofreads every article and corrects my punctuation. She gives me the confidence I need to publish the article. Today marks the second anniversary of Uniting Caregivers. I’ve learned much about caregiving and caregivers through the story’s others have shared. Through my experience the past two years, I realize how therapeutic writing is. It has increased my understanding of others as well as myself. As I search for the right words to express my thoughts and feelings, I come to see things more clearly. Every caregiver I see, I admire. They’re putting another’s need before their own wants. I feel their exhaustion and worry. I share their overwhelming responsibility and increased love for the person they care for. Without even exchanging words, I feel connected to them. I want to know about their story. How do they manage all they have to do? What keeps the love growing and resentment at bay? When would they have time to share their thoughts and feelings? I’ve greatly benefited from this experience and appreciate you as a reader or a guest author. If you’d like to share your story, I’d love to publish it on Uniting Caregivers. It may seem like a daunting task, but I’ll help and support you any way needed. Your experience will be valuable to me and to others. We are in this together, encouraging and inspiring one another.